Thread: Usain Bolt, the fastest man there has ever been. After watching him take the 100 metres a couple of days back, literally jogging for the last 20 metres en route to the world record, I thought I'd seen it all. But that 200 metre performance now was phenomenal, i think second and third are still running. Ripped the world record to shreds at 19.30 seconds, well over 23 mph. bit of history to watch the fastest man that has ever lived and still only 21 years old. Could have done without the 30-minute victory dance that Thai TV felt vital -- cutting into the US basketball game v Australia. Bolt, and as we say in Australia he can certainly do so. Amazing how these unknowns come out of the athletic woodwork exactly at the right time. Is he wearing an I love the king bracelet? yes, i'm very skeptical on the cleanliness of athletes, but this guy is tall and thin and not at all the typical meat head powerhouse drug riddle sprinter. i think he has some sort of freak physiology like michael Johnson. Michael Johnson had height affliction. His torso was longer than his legs. A veritable dwarf. 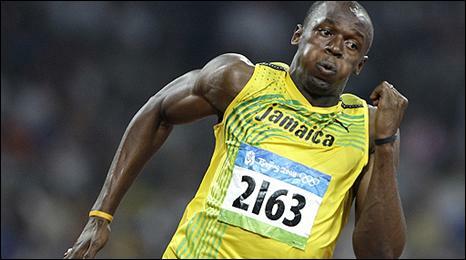 Very little in common, physiologically, with Bolt, who has great sprinter's proportions. freakish physiology is what they have in common. I was reading something the other day(can't remember where) that said the current world records could only be beaten by a few tenths of a second as the human body isn't able to cope with much more, tendons would start tearing etc. but to see how easily Bolt ran the 100 and 200 i think he could maybe take another half second of his current times in the future. strange shape, but listed at 6 foot 1. If he bothers to the run the 100 meters flat out to the line like he did in the 200 today, i reckon he can go 9.5 in the 100. He has one leg shorter than the other. Nike spent a fortune to correct the problem and with those famous gold running shoes. Just chop him at the knees problem solved. Oh damn, it was between the pelvis and the knee!!!! You are the expert on these matters. your gonna need some greens I thinks! still only 21 years old. Astounding isn't it. I'm not sure if the same olds true for sprinters but generally atheletes don't even hit peak physical form until sometime in thier late 20's or early 30's. If he can stay motivated and injury free imagine what he has got left to offer! lightening Bolt is a phenomenon. Could he also do the 400? and be the first Athelete to win 3 golds at these distances? with Bolt, who has great sprinter's proportions. Quite tall, in fact by far the tallest 100 meter champ ever.What an athlete though, like he was shot out of a gun at the start. Certainly wouldn't bet against him being able to at some stage. Huge difference though between the 100, 200m and 400m - and not just the obvious distance differences. Entirely different training programs and race tactics I think. Maybe when i get home next week (that's if TOT have sorted out our phone line yet). he ran 19.31 into a wind of 0.91! hehe. torrents are blocked before any streaming video. any kind of bandwidth hog is blocked.